When is a handstand not just a handstand? The answer, in this case, is when Robin Ann Meyer literally turns this challenging pose into performance art. 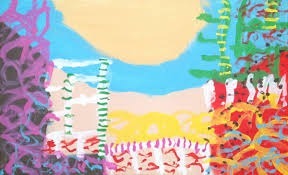 At the same time Robin Ann manages yet another creative feat, by holding a paintbrush in her toes, dipping into pigment, and applying it painstakingly to a canvas. The performance–and the results–are quite astonishing! 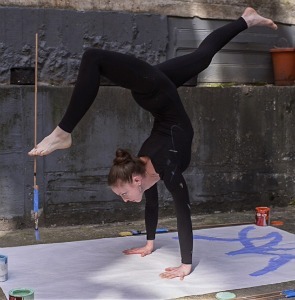 YogaCityNYC’s Sharon Watts sat down with Robin Ann to find out more about this topsy-turvy approach to both her yoga practice and her painting discipline, just before her public debut as a performance artist at the Lotus Shakti Summit at Laughing Lotus Yoga Center later this month. Sharon Watts: Which came first–your yoga or your art? Robin Ann Meyer: I think I’ve always drawn. The yoga started when I was about fourteen, with a Patricia Walden video at home in Rochester. My mom got me started in both art class and then yoga at her gentle Iyengar class. At eighteen, I went to an ashram in Pittsburgh where I started a daily practice in the Sivananda style, and a few years later went abroad to study fine arts. I was also reading Swami Devananda’s book and incorporating therapeutic/breathing asana into my practice. SW: At what point did yoga and art really converge for you? RAM: There was a point in my life a few years ago when I felt stuck in my ways, my work, my personal life. I was in need of a growth spurt. In my yoga practice I learned to do a handstand. It was really interesting to hit that balance point, after initial fear and doubt, both in my body and my mind. I use art as therapy a lot, and I decided I needed to look at everything from a different perspective. I wondered if it was possible to complete a painting with my feet while standing on my hands. SW: How did it feel when you first made the attempt? And what was your biggest challenge? RAM: Everything was stripped away–my ego was banished to the backseat. I was like a baby. Developing motor skills was the biggest challenge. Exploring pressure sensitivity by just dragging the brush, I had to be satisfied by both the effort and the result. Normally I am a very precise, clean painter, but something more primitive emerged. As a trained artist, it was frustrating not to be able to do what I wanted. That feeling of deprivation from not using my hands lasted over a year. SW: What is your process now, and how important is mindfulness? RAM: I think about it all, paying close attention to intuition. After getting over the fear, I let it just evolve; I play, experiment. The brain is very involved, even though it’s a meditative activity. I have to be totally present. If not, I’ll just fall over and make a big mess. It takes about a month to complete a painting. I work every day for a period of 20-30 minutes, in small increments of time, coming up and down. I start by staying up between 1-2 minutes, and then I get progressively more tired. Although sometimes I get into it and can stay up longer. SW: Did you start with the intent of being a performance artist? And is the performance art more or less important than the final result? RAM: That wasn’t the intent, but it’s grown into that. First I wanted just to see if it was possible. After that, I found myself considering color (pre-chosen), and composition, where an internal instruction accompanies meditative awareness. Impromptu decisions direct my body how to accomplish this. All of the elements are really important, and it will take a while to feel that the aesthetic of the performance is developed enough. So far the performances have all been done for video installations. In fact, the upcoming summit event at Laughing Lotus will be my first actual performance with an audience! SW: Tell me more about the upcoming live performance at Laughing Lotus. What can we expect? RAM: This time it will be more than my feet–it will be all appendages from all angles! I will stand in the middle of the canvas and gradually move around for 20-30 minutes. I think these are interesting because the formations that evolve actually reflect the energy fields around us. And it’s all for a good cause: there is a raffle that supports the Lineage Project, which brings yoga and meditation to at-risk youth in NYC. SW: Art and yoga are very similar, and viewing them as one entity is an interesting concept. What are your thoughts on that? RAM: Yoga practice is the first thing I do, every day. As for studio practice (I am referring to painting, or whatever creative outlet one has), the artist has to get in there and do it–otherwise we develop fears and anxiety over the end product instead of working through the practice. I like the repetition of painting symbols because that is meditative, and I am always working on balance–both in my yoga pose and in my composition! I think the arts are what make us human. That’s just what we do. We wake up, we breathe and move, and then we create.